AutoPilot Chlorine Generator 36 Digital Disp. 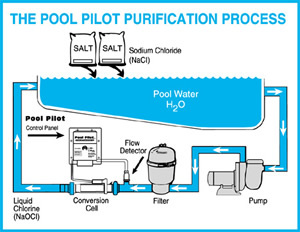 With Microprocessor controls, digital read-out of pool water temperature, current salt level, purifier production level, Soft Reverse cell cleaning cycle and Boost Cycle, the Pool Pilot Digital is a technologically advanced unit. The easy to read digital readout on this In-Line unit even tells you how much salt to add should it run low. The Pool Pilot Digital has a patented temperature compensation feature that actually adjusts chlorine production according to the demands of the water temperature and operates in water temperatures up to104. It can purify pools up to 20,000 gallons and has a built-in time clock to control your pool pump...all at the touch of a button. I have about a 13,000 gallon pool with spa with would be the best pool pilot clorinator for my pool. A Answered on 7/25/2017 by InyoPools Product Specialist Alex V.
Hello, Yes, this would be adequate for a 13,000-gallon pool. Hello Glen - The DIG36 has a digital display and the ST36 features "soft touch" buttons with LED lights. The DIG36 can provide power to a 2.5HP pump at 220v if you purchase an optional Relay Kit. If you are installing a variable speed pump, the AutoPilot will only provide power. The controls would be operated at the variable speed pump. You can view the pricing of the replacement cells here. Loved this system during the summer. We were first time pool owners this year and after the initial balancing of chemicals, we didnt touch the chemicals for the remainder of the year! WE have owned an Autopilot before and just replaced it after 10 years. There are several on the market for less, but when you see the quality you will buy Autopilot.We bought the difital to the the timer, now we set it and it runs the pool pump and the sanitizer. No fuss and saves on electricity. Now I don't have to make sure it is turned off after 8 hours. Just an added note, if you plan to run your single or dual stage pump with the Pool Pilot, make sure you ask about the optional pump relay. After some research I decided on the Auto Pilot and couldn’t be happier. Easy to install and setup, no more chlorine. 15,000 gallon pool and the 36 cell makes all the chlorine I need for here in the Desert.